WORKING TOGETHER : Beach House Bistro Chefs and owners Liz and Gerald Bednorz worked for various restaurants around the area until they decided to go it for themselves. It may appear that I’m stuck on comfort food restaurants lately, but it’s simply that I’m following the current preference of most American consumers for quality and value. People want old-fashioned American foods at reasonable prices while being able to enjoy that meal in a relaxed, friendly atmosphere. After my review of Rosie’s Restaurant in Nipomo, I discovered its soul sister restaurant that has much in common with it, the Beach House Bistro in Morro Bay. During my first visit with a friend, we shared several good dishes from the menu and the daily specials board. This is one of those rare little cafés where everything is made from scratch—and that certainly isn’t typical in any place with the prices they’re charging here. Not only that, it’s owned by two culinary school trained chefs, Gerald and Liz Bednorz who are married. He’s responsible for the main menu; she makes the breads and desserts and waits on diners. When we walked in, Liz invited us to sit anywhere we liked, handed us menus, and pointed out the specials board that changes daily. Among our starters (not unexpectedly), we had the clam chowder, described by Liz as “the best in Morro Bay.” It was as delicious as promised: generously filled with clams, neither too thick nor over-filled with potatoes. Gerald makes the clam chowder daily, and he also makes a seasonal soup du jour, which was chicken tortilla the Tuesday evening I visited. Gerald always has special appetizers on the board, like his signature rib ends with watermelon barbecue sauce and a side of fresh Napa slaw ($9). Dressed with a sweet, tangy, fruity sauce, it was quite tasty on the small but meaty ribs. Popular among his regular customers (all of whom walk in and immediately sit down at their favorite table) are the beach bundles: a blend of havarti and cream cheeses with salmon, fresh dill, and chives, wrapped in a wonton, fried, and served with a Thai peanut sauce ($12). They’re unique but a tad too rich for my taste. I preferred the Firestone walker poached prawns with Gerald’s spicy cocktail sauce ($7). SWEET! : This ice cream is homemade, and the berries are from the Bednorzes’s own berry bush. As dinner progressed, both chefs visited us more often, providing their interesting history. Chef Gerald, a friendly character, sports the most colorful chef’s attire I’ve witnessed. A fellow Giants fan, his baseball memorabilia decorates his kitchen. His life partner Liz loves beach glass, which she collects to make beautiful jewelry and wind chimes that she sells to support Susan G. Komen’s “Race for the Cure.” Liz also joins in the annual race to raise funds. And for the past 14 years on Independence Day, the Bednorzes offer their “4th of July Drive-Through BBQ” to raise money for the clinic. For $13, customers get a complete meal to go that includes tri-tip, chicken, beans, salad, a brownie, and a soft drink. One hundred percent of the money made goes to the Susan G. Komen charity. “Over the past 14 years, we’ve raised over $150,000,” Liz noted, with good reason for being proud of what they’ve accomplished. Liz and Gerald have 35 years of experience between them as professional cooks. The couple met in Albuquerque while working at a Ramada Classic Hotel restaurant. They became best friends, going to baseball games and dining out together. After 15 years, they married and have now been together a total of 30 years. 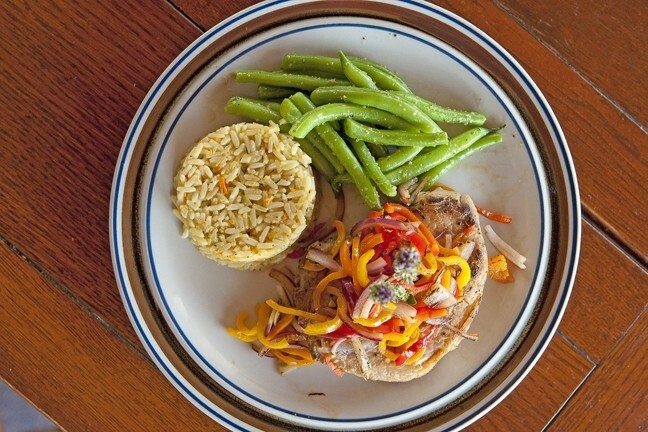 FOOD FOR THOUGHT : Entrees include classic favorites like pork (pictured), chicken, and fish. They opened their restaurant on Dec. 7 in 2001, after completely remodeling the building. His generously portioned entrees are classics: lean pork medallions with a yummy apple/brandy compote ($17); breast of chicken Diane with a rich sauce of Dijon, brandy, demi-glaze, and cream ($16); and always a fresh fish of the day (prices vary). I thoroughly enjoyed a French-style sautéed halibut with beurre blanc (white wine/butter sauce), fresh green beans, and roasted garlic mashed red potatoes. Entrées average $14 to $23 and include freshly baked focaccia, fresh vegetables, and choice of roasted garlic mashed potatoes or saffron rice pilaf. If you upgrade your meal with a cup of clam chowder, it’s only $5, or you can add a cup of the daily soup or choice of spring or Caesar salad for an additional $4. 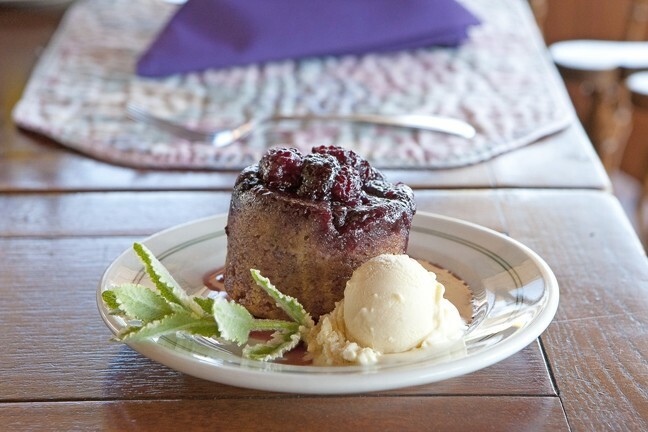 Liz’s desserts, always listed on the specials board, are not to be missed either. At one point in her career, she’d spent three years baking pastries at Hoppe’s Garden Bistro. She recalled trying to get chef Bill Hoppe to let her make cheesecake for dessert, but he preferred classic European desserts. “One day he finally let me make my cheesecake, and after he tasted it we put it on the menu,” she said. 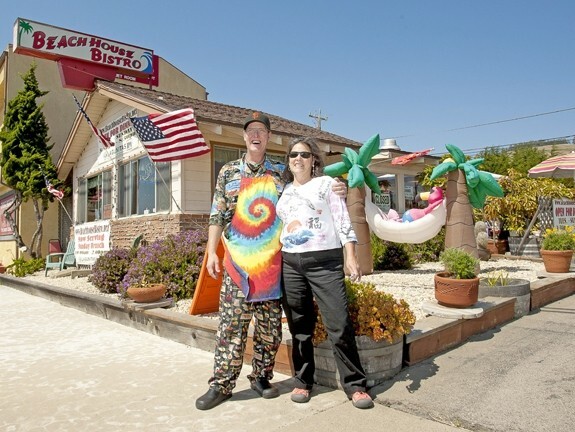 HIT THE HOUSE: Beach House Bistro is at 2770 Main St. in Morro Bay. Call 771-9705 for more information. All of her desserts are made from scratch, including pie crusts or the cake crumb crust she uses for the cheesecake. Everything is seasonal, so the toppings and the desserts change throughout the year.